Ships tomorrow if you order in the next 19 hours 37 minutes. 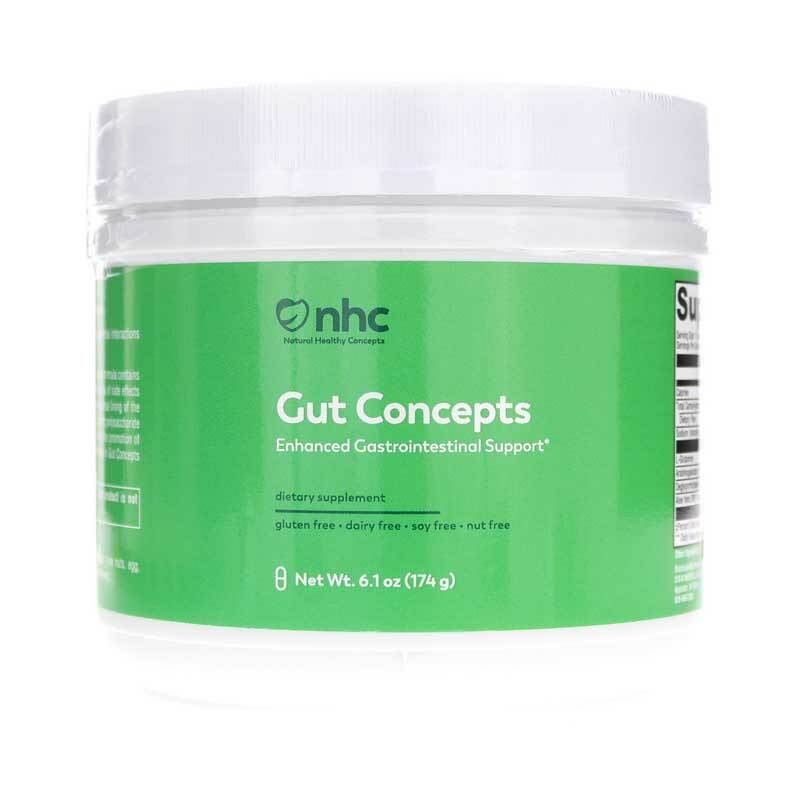 Gut Concepts from Natural Healthy Concepts features four specialized ingredients for enhanced gastrointestinal support. 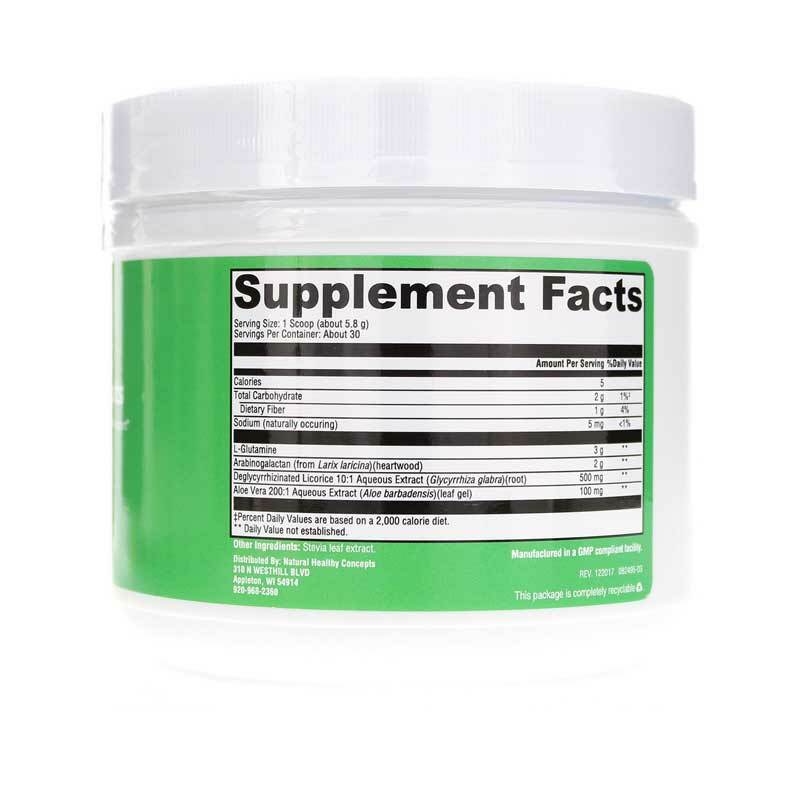 This unique formula contains a concentrated extract of licorice that has been processed to remove glycyrrhizin - thus reducing risk of side effects associated with licorice. Glutamine serves as the predominant fuel and nitrogen source for the mucosal lining of the gastrointestinal (GI) tract. Arabinogalactan from the North American larch tree is a naturally occurring polysaccharide that provides excellent support for GI health. Research suggests that arabinogalactan plays a role in the promotion of gut microflora and may increase beneficial short-chain fatty acid production. The Aloe vera leaf extract in GlutAloeMine has been processed to remove the bitter principles and prevent a laxative effect. Other Ingredients: Stevia leaf extract. Contains NO: Wheat, gluten, yeast, soy, animal or dairy products, fish, shellfish, peanuts, tree nuts, egg, ingredients derived from genetically modified organisms (GMOs), artificial colors, or artificial sweeteners. Adults: Mix one scoop in 2-4 oz water once daily, or as directed by your healthcare practitioner. Consult your healthcare practitioner prior to use. Individuals taking medication should discuss potential interactions with their healthcare practitioner. Do not use if tamper seal is damaged. Keep out of the reach of children. This combination of ingredients with l-glutamine, aloe vera and licorice seemed to make sense to me. After taking it for a month, I feel better. Gosh, I can't believe how much better I feel after using this and cleaning up my diet, getting rid of the gluten and taking digestive enzymes. Who knew! Starting to believe health begins in the gut. A couple months on this and I am a believer!